If you are a film lover, you will probably have come across the Ted comedy film made in 2012. This is one of the landmark comedy films ever produced in the history of the movie industry. Blueprint Gaming realised the significance of this film and had decided to create a casinos online alternative to the film. 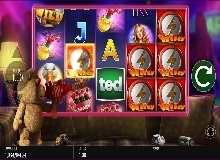 Ted slot made by Blueprint Gaming is a game filled with humour, and that will make you forget any bad thing that has happened to you. But it is much more than that. This great casino game also has the unwavering ability to give you real money and the kind of enjoyment you never imagined that you would get in the world of casino, although virtually. Just like Blueprint, we are also privy to the importance of this slot, and we have decided to write a thorough and objective review of the pokie so that you can understand the mechanisms and how to go ahead playing it. Ted casino slot online from Blueprint Gaming comes with many great features. The game has 5 reels and 20 paylines. The least number of coins that you can have on a line is 1. The highest amount of bet that you can place in the game is 25 credits while the least betting amount that you can put in is 0.01 credits. With this, you can see for yourself that this pokie is for everyone regardless of their financial strength because it covers a very wide range of betting amount. Having said that, one great opportunity that you now have is the jackpot. If you play well to hit the jackpot in this pokie, you will get nothing less than 500x. This pokie also promises to be a great and rewarding one based on the value of the return to the player. It has a return to player (RTP) of 95.8%, and with this, you can be sure that you have a good chance to play Ted for real money. Playing this video slot, you will come across a lot of symbols. Some of these icons which you need to watch out for because they have a high value include Lori who happens to be John’s girlfriend, a swan, a bong, the game’s logo itself which can show up as being stacked on the reels, and then, some bottles of beer. There are also some low values icons that should not really get your attention, they are a J, K, A, and Q. The wild icon is denoted by Ted himself. Being the wild, Ted can displace any icon in this game with the exception of the Thunder Buddies. Doing this, Ted will complete the winning combination. There are some great bonus features that you need to look for as you play this game. They are discussed as follow. Bar Crawl Bonus: You have to choose bottles in the board game to get a multiplier and special squares that will give you additional prizes. Big Money: You will have access to a large multiplier which you can use to increase your total winnings. Flash Free Spins: You will get a pre-determined spin after which you will have a bonus awarded to you. Wheel of Fortune: You will need to click on Ted in order to unleash a multiplier, an arrow or a spin. Here, you will have the opportunity to choose one of 6 different features to get your amazing prize. The options are a Laser Gun Wilds, Beer Streek, Psychedelic Colossal Spin, Psychedelic Bonus Boost, TV Remote Symbol Streak, and Psychedelic Super Spin. As you choose one of these icons, you will get the bonus that comes with it. With a return to player of 95.8% and a jackpot of 500x, you need to play Ted slot machine online.